The Galileo Aria is a luxuriously handcrafted petite-grand piano with intricate wood details and exquisite craftsmanship. Designed and constructed in Italy by skilled artisans, the Aria makes a distinctive statement for your home. The Aria starts with an award-winning Wooden key action – simulating the world’s most prestigious concert pianos. The technological process that produces the sound is recognized by experts as the finest in it’s field. This exclusive technology – called iMotion™ – helps you produce all the subtle nuances and timbres of a concert grand piano. The user-friendly layout makes it easy for you to choose from the many entertaining features and there are handy headphone connections for silent practice. Of course, the Aria not only sounds great—but it looks great too! 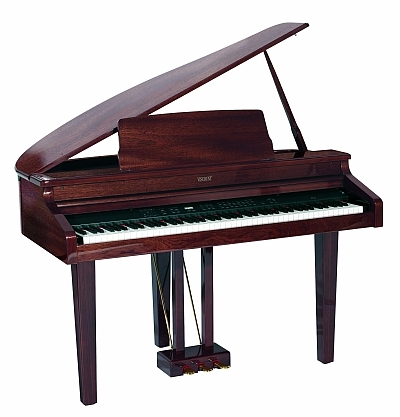 The elegant all wood cabinet has a genuine 19-ply wood rim and authentic piano details—and the powerful Acoustic-Chamber III™ Sound system produces concert-quality sound. The Galileo Aria – an affordable luxury that enhances your home. All Wood hand-crafted construction, sliding roll-top key cover, 19-ply all-wood rim, True Polyester finish.